ST. JOSEPH, Mo. – Thirty home contests and a Fourth of July Holiday Weekend full of festivities at Phil Welch Stadium highlight the St. Joseph Mustangs’ 2016 schedule. The Mustangs will open the summer at home on June 1 against the Ban Johnson Raiders. The non-league slate also includes a matchup against the Carroll Merchants for the second year in a row, St. Joe’s first all-time meeting with the Sioux Falls Pilots, and the annual Mustangs Alumni game on June 11. The Mustangs – MINK champs each of the last two seasons – will begin their league title defense on June 2 at home against the Sedalia Bombers. That game begins a run of five straight league contests in the first week of the season. St. Joseph will also see a crucial stretch of road games in the third full week of the season with a doubleheader in Sedalia on June 20, then another twinbill on June 21 against the Nevada Griffons – the 2015 MINK League South Division winner. 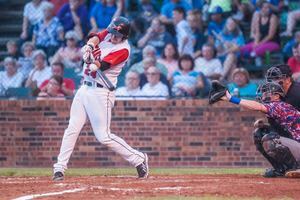 Phil Welch Stadium will be busy throughout another Independence Day weekend with a six-game home stand beginning June 29 when the Mustangs host the Rossville Rattlers, the defending Mid-Plains League champions. The stretch concludes on July 4 when St. Joseph plays Sedalia. Fireworks will be featured after games on July 2, July 3 and July 4. “This should be an exciting year. We’re playing host to some great teams from all over the country. We’re excited about the honor of hosting the MINK League All-Star Game and Home Run Derby again. There’s some great baseball to be played this summer, in front of some of the greatest fans,” Mustangs General Manager Ky Turner noted. The regular season concludes for the Mustangs on July 24 in Clarinda. The revamped postseason begins on July 26 with the the top two teams in each division meeting for the MINK League Wild Card game. The MINK League Championship series begins two days later. St. Joseph won 35 regular season games in 2015 on the way to its fourth MINK title in the last five years. Season tickets and group outings are available now by calling (816) 279-7856. To view the entire 2016 schedule, click here.